Let the debate begin — where does this Auburn team rank in school history? After tonight’s 89-75 evisceration of the Kansas Jayhawks, you’d be hard-pressed to find them anywhere but the top two spots in that category. 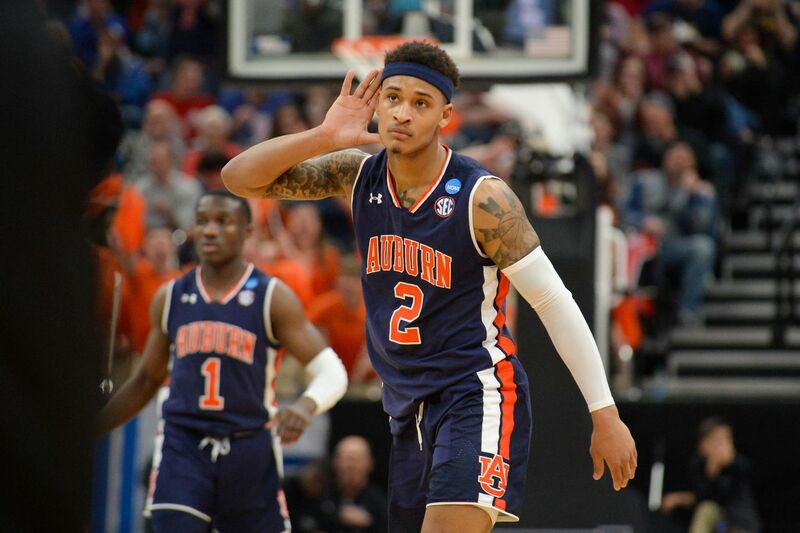 Auburn completely annihilated the 4-seed Kansas in Salt Lake City to advance to the school’s first Sweet Sixteen since 2003, where they’ll play the winner of the North Carolina-Washington game. It’s hard to say whether or not Auburn’s ever played a better first half than they did tonight. The Tigers roared out of the gate and forced Kansas coach Bill Self to use timeout after timeout to help his team regroup. Bryce Brown started 5-5 from three-point range, and Auburn outscored the Jayhawks 26-1 in fastbreak points before halftime. At the 13:09 mark, Bryce Brown’s fourth three forced a timeout with Auburn ahead 23-9, but the lead kept growing. Up 34-15, Auburn withstood a mini-run by the Jayhawks as they found their way to the foul line on several occasions, but they only got back with 14 points. A Chuma Okeke three ended the KU run, and Brown’s fifth three gave Auburn the double-up lead at 40-20. By the time Jared Harper’s final teardrop fell in the closing seconds, Auburn led 51-25 at the half, and had controlled the game from start to finish. The Tigers had hit 56% of their shots, including 9-17 threes, while out-rebounding Kansas 19-17 and forcing eight turnovers. Auburn was faster, bigger, quicker, more dedicated, and more dialed in during that first half in every aspect of the game, and the Kansas contingent looked completely shell-shocked as they walked into the locker room. Auburn hit a historic note during the first twenty minutes as well. For Bryce Brown, his third three of the half put him all alone in second place in SEC history for career three-pointers with 368, ahead of Pat Bradley (366) and Shan Foster (37). He’d finish the half with 370 career threes. At the start of the second half, both teams came out hot. Kansas trimmed the Auburn lead momentarily by making the first seven shots from the floor, but the Tigers answered. Auburn buried three early threes and hit their first five shots and still held a 66-41 edge at the under-16 timeout. Kansas made a run, and a pair of three-point plays cut the lead down to 67-49, but Bryce Brown’s seventh three and an Austin Wiley transition dunk ended that run, before a Malik Dunbar and-1 gave Auburn a 25-point lead again. J’Von McCormick got an opportunity to run the point early and often i the second half, and his followed putback gave Auburn its biggest lead at 78-51 near the eleven-minute mark, and despite KU’s hot start, they still trailed by 25 at the under-12 timeout. Kansas actually played really well for the first two-thirds of the half, shooting the lights out, but couldn’t consistently cut the lead under 20 points. In the end, Auburn cruised to a relatively easy victory over a team featuring three McDonald’s All-Americans and coming off of one of the greatest streaks in college basketball history (14 straight conference titles). Bryce Brown led the way with seven threes and 25 total points, while Jared Harper added 18 as the Tigers shot 53% overall and hit 13-30 threes. There’s much more to come on this, but War Eagle, y’all.